Do you have tight shoulders and neck muscles from keyboarding, texting and hours at a desk? Then this video is for you. Today is a super special video because I am going to gift you, absolutely free, exclusive content from our membership community, to give you a taste of the value added content our members have access to there. Today I’m going to teach you how to release your shoulders with a soft foam roller which will scratch the surface of myofascial release with a soft foam roller but if you want to go deeper, with this leading edge research, support from me and our amazing community then you need to be part of our membership community, and I will tell you about that at the end. Lie on your side with your top knee bent. Place foam roller in underarm. Roll up and down, side to side, and take focused breaths. 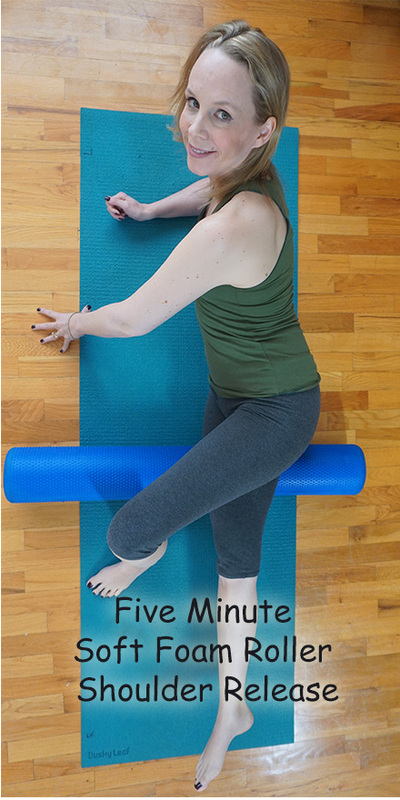 Using the soft foam roller breaks up adhesions in your soft tissue returning it to a flexible state. When you practice self myofascial release regularly it can lead to restoring the smoothness of your fascia, improved circulation, decreased pain and overall improved range of motion. Thank you so much for watching. If your shoulders, neck, and upper back are feeling better now, be sure to let me know in the comments and hit that thumbs up button. At the beginning I told you I would let you know where you could go to get the leading edge research on myofascial release with a soft foam roller and more support from myself and our amazing community. I’ve just released six more classes just like this in our membership community to release your shoulders, neck, upper back, inner thighs, groin, glutes, quadriceps and IT band, in addition to our already existing 28 videos for your connective tissue in our membership community. That means we have 35 connective tissue classes to support you, all organized for you in a comprehensive playlist including instructions and support for how to start. We are even having fun weekly and monthly challenges for Fascia February. If you would like exclusive access to this amazing content then click here to become a member today. 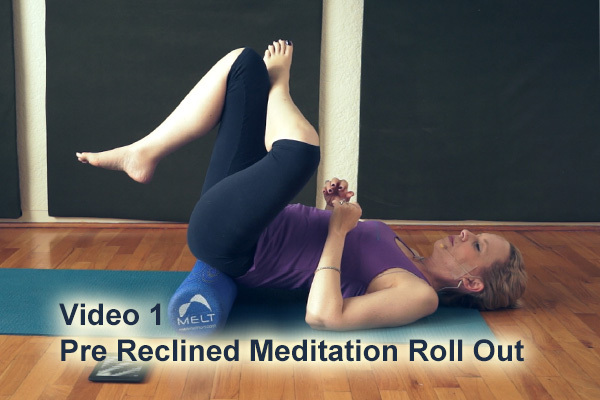 This soft foam roller sequence is designed to release all the points that are connected to the floor during your reclined meditation, bring them into a more relaxed state and connect them more deeply to the ground. You will begin the night before by releasing your feet. Then we release your spine, and upper back. We move to your glutes, so that your buttocks can rest completely on the ground. We will return to your upper back and shoulders so this part of your body can thoroughly relax on the earth. There is a special sequence to soften your forearms for deeper relaxation of your shoulders and hands. Finally we will do a self-myofascial massage for your neck so that your head can rest completely on the ground. 🙂 Enjoy! Restore healthy range of motion to your shoulder and relieve pain in your shoulder neck, forearm, wrists, hands and fingers. Your soft foam roller is one of the most effective myofascial release tools that you have. These movements will restore circulation and reduce referred pain in your upper body. Gentle compression will help to relax tight muscles and adhesions formed between your upper back, neck and shoulders. You will be left with an upper back, neck and shoulder area that is as soft as a baby’s muscles. In this foam roller video we will release your inner thighs and groin. Releasing your inner thighs can help to reduce pain that you may be experiencing in your lower back, hips and knees. It can also improve the mobility in your hip joints. In this video we will practice compression and myofascial release of your quadricep muscles so that the muscles can soften and allow for normal blood flow to return. The benefit of foam rolling your quadriceps is reduced knee and low back pain. With practice you will experience a restoration of healthy tissue of this dense muscle group. In this video we will be breaking up the adhesions on the ever tight IT bands. This video puts targeted pressure on your IT band to release trigger points and relieve pain. This video is excellent for runners, people with knee issues, and anybody with IT band syndrome.